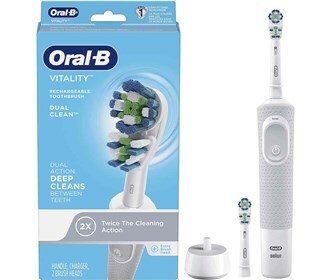 The Oral-B D12523P is a Vitality Dual Clean rechargeable electric toothbrush that uses 7,600 high speed oscillation for surrounding each tooth for better overall cleaning than a manual brush. The Dual Clean brush head of this toothbrush provides cleaning and gum care with MicroPulse bristles. It features 2 minute timer that signals after two minutes to help you brush for the recommended brushing time. The Oral B D12523P has many exciting features for users of all types. You can extend the lifetime of your Oral B D12523P with the purchase of a FactoryOutletStore Factory Protection Plan. 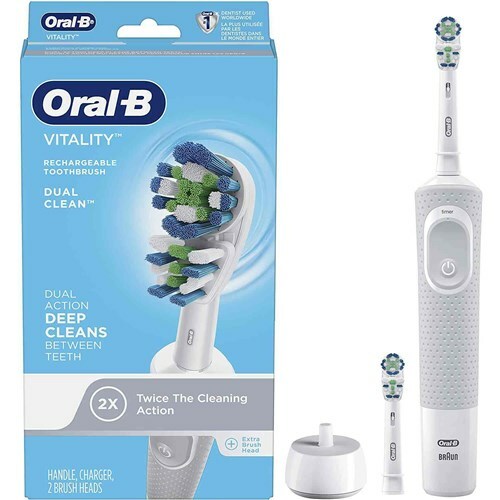 See the Oral B D12523P product video and gallery images above for more details. FactoryOutletStore stocks a full line of accessories like BreathRx Antibacterial Mouth Rinse, BreathRx TongueScraper, and BreathRx Whitening Toothpaste for the Oral B D12523P. The Oral B D12523P is sold as a Brand New Unopened Item. How do you open handle to replace battery? I have tried all I can do. Love product.